Advanced Equipment offers two seafood IQF spiral freezer systems and 7 IQF tunnel freezers for the seafood processing industry. The main reasons why so many seafood processing plants rely on our spiral and tunnel freezers is quality, reliability and the low cost of ownership. Our freezer engineers can build an IQF freezer designed for your specific seafood products, your plant size and budget. You are in the right place to maximize your profits with Advanced seafood spiral and tunnel freezers. All freezers are designed and customized for the product, and CIP cleaning features you need. Advanced spiral and tunnel freezers know that small and larger food plants have different needs. In addition, if the belting and speeds etc. are customized for the products, and you will have a better and higher performance freezer. Call us to get a quote and to talk to a real freezer engineer to get the facts. 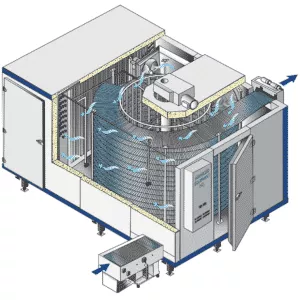 Advanced spiral and tunnel freezers also offer exceptional cleaning and sanitation features to keep seafood processing plants operational with the least amount of downtime. 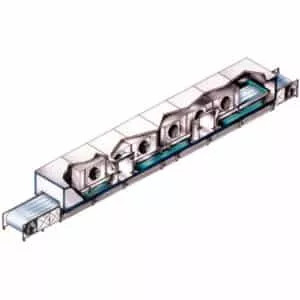 Advanced has designed and manufactures our own CIP 'Cleaning in Place' Technology based on knowledge gained from over 30 years of experience in spiral and tunnel freezers. With the Advanced IQF freezer cleaning system (CIP), all you have to do is press one button and the system automatically cleans your spiral or tunnel freezer. Our automatic cleaning systems run on washing cycle timers like a modern washing machine. Complete integration of our freezer cleaning system ensures automatic and trouble-free cleaning with higher economic efficiency. 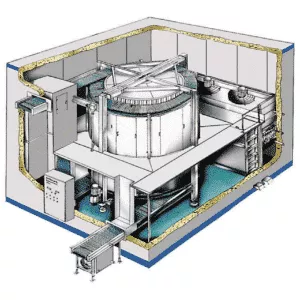 Advanced Cleaning-In-Place (CIP) and Sterilization-In-Place (SIP) systems provide automatic cleaning and disinfecting without major disassembly and reassembly. This is why Advanced customers enjoy minimal down time and lower labour costs with our spiral and tunnel freezers. Do You Need to Quick Freeze Seafood? Advanced freezer manufactures a variety of Tunnel and Spiral freezers for the seafood industry. Depending on the your seafood processing needs, an Advanced engineer can help you pinpoint the IQF freezer solution that is the right fit for your seafood freezing needs. Give us a call and an Advanced refrigeration engineer can answer any question you may have on our seafood spiral and tunnel freezers. You can also schedule a free consultation on our spiral and tunnel freezers. Advanced Site Built IQF Spiral Freezer designed to minimize product weight loss and assure quality gentle handling during the freezing process. Completely factory assembled and designed to minimize site installation time. SEAFOOD INDUSTRY: cooked shrimp, skin on shrimp, scallops. 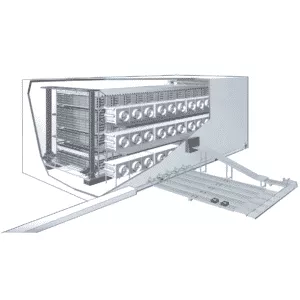 Advanced Impingement Polybelt Tunnel Freezer utilizes a solid flat top polyethylene belt, which allows for gentle handling of the product and leaves no surface marks. Ready to be moved into place. 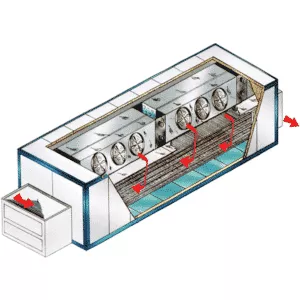 The freezer is a continuous in-line-belt freezer designed to minimize product weight loss and assure quality gentle handling during the freezing process. Saving in processing floor space. Low operation cost.